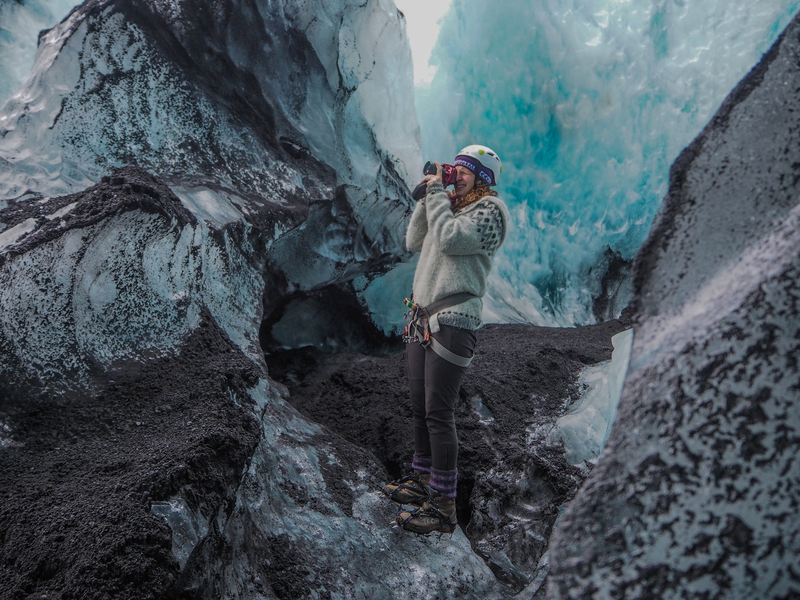 Live to the extreme with this exhilarating hiking tour up one of Southern Iceland's most majestic features, the mighty Sólheimajökull glacier. This tour is the perfect holiday opportunity for those travellers seeking to mesh incredible natural landscapes with the thrill of adventure. 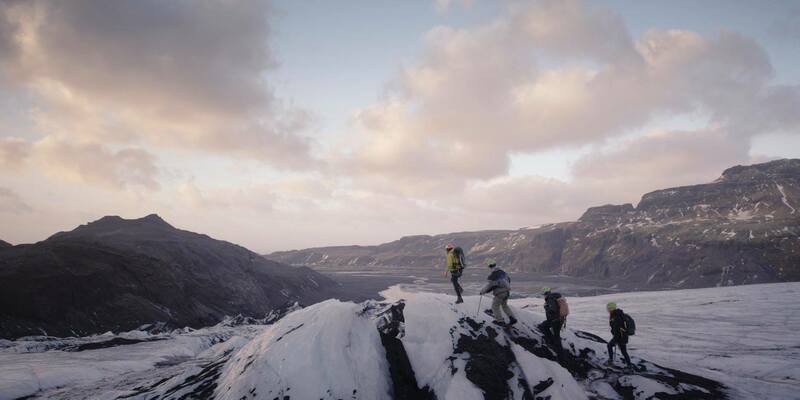 At the car park of Sólheimajökull glacier, you will be introduced to your highly trained guide for the day who will proceed to lead you on a brisk 15 minutes walk to the glacier. It's a great chance to get warmed up before the hike! Should you prefer to be picked up in Reykjavík, you can book a sightseeing day tour that includes a glacier hike here: South Coast & Glacier Hiking on Solheimajokull from Reykjavik. Your guide will also provide you will of the necessary equipment that you will need on the glacier, including crampons and ice axe. As you begin your hike, a new world of intricate ice sculptures and intriguing natural phenomenon will reveal itself to you. You will see many hundred years old ice, coloured deep blue due to the trapped oxygen bubbles inside. You'll also gaze into the dramatic icy canyon of a glacier moulin, just one of many that carve the glacier from top to bottom. From the heights of the glacier, you will have fantastic views of your surroundings. On a clear day, it is even possible to see Eyjafjallajökull, the notorious glacier which brought European air traffic to a halt after its fiery 2010 eruption. 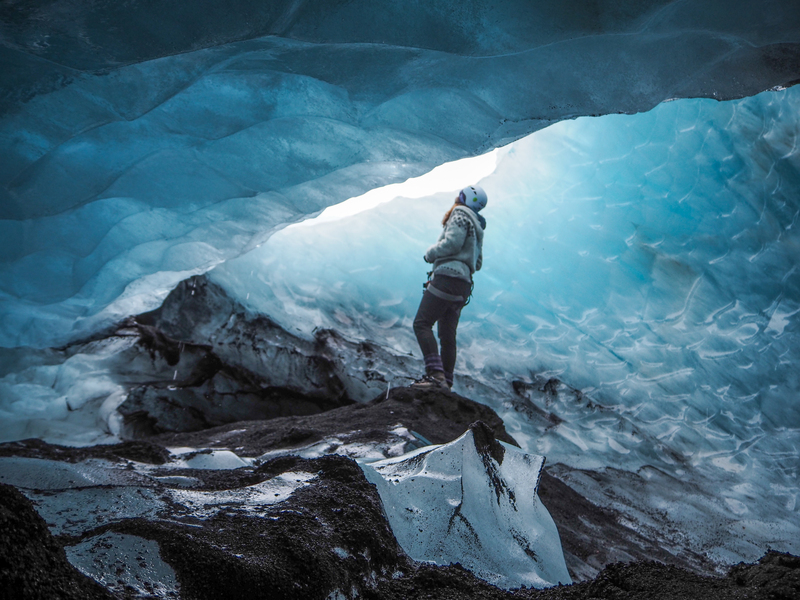 Don’t miss out on this fantastic opportunity to explore the untouched and ancient wilderness of Sólheimajökull glacier! Check availability by choosing a date. Departure time : 09:30, 11:00, 13:00, 15:00. Your tour provider can always assist if you have special needs, just send an e-mail to let them know what you need and they will do their best to assist you in every way. Note that Icelandic roads and pavements can be slippery in the wintertime. We recommend you bring shoes with slip-resistant soles or ice-grip shoe covers if you are visiting in the winter. The covers can be purchased in most supermarkets and gas stations around the country. Our guide was amazing and really knowledgeable, and the hike up was incredible. It got crowded quickly, so I'm happy we went on the morning tour. That being said, there was a snowstorm the previous day, so the glacier was covered in snow and you couldn't really see much. So just keep the weather in mind when you're booking this tour! Sarah was a terrific guide who was very knowledgable about both the glacier and the area in Iceland. She took us all the way up the glacier where the view was incredible and slightly into a moulin for a great experience. We were on a very sunny day that changed to light flurries near the end of the tour. However, the wind at the top really hits you hard so dressing warmly and properly is super important to being able to enjoy the full experience. Loved the tour! The tour was good, overall. However, the tour guide simply led us up and then down the glacier. I wish we could have stopped and looked at caves and other cool things I saw along the way. Our guide, Sarah, was great and we ended up in a small group (just myself and a friend + another couple) so we were able to cover a lot of ground and have a really customized experience! Sarah was knowledgeable and the scenery was amazing. She gave us a great tutorial of how to use the crampons and pickaxe that were provided prior to heading out and talked to us about the glacial features and surrounding landscapes throughout the tour. It was a wonderful experience! You need proper gear to do this trip. When we went it was raining half the time. We had top to toe waterproof gear, but not everyone. Good amount of hiking involved. I loved all the colours, and shapes. Guide knowledgeable, ensured safety. This is something so unique, a must do in my opinion. Plan some hot springs for afterwards if you get soaking wet. The weather didn't allow us to do the full experience but it was still nice. Paulina, our guide, was knowledgeable and funny. I recommend to do it early on the day before a lot of people come and see. Fue una experiencia increíble. Nuestro guía Stefano nos enseñó multitud de cosas sobre el glaciar y la formación del hielo a lo largo de su historia. Además tuvimos la suerte de disfrutar de buen tiempo aun siendo mediados de Octubre. Sin duda, una aventura que querrás experimentar en tu viaje a Islandia. The weather was everthing rain and Sun, and rainbows - very nice. God time on the glacier and no stress. All in all a grelt experience. This was a great experience. The weather was perfect! Our guide, Micheal, was knowledgeable & friendly. He showed us some amazing sights on the glacier and surrounding landscapes. We did the 9:30am hike which was fabulous with only 5 people. Micheal was able to show us lots of parts on the glacier, explain facts and point out highlights. This was definitely one of the highlights of our trip. So glad we booked this hike. Glad we had small group. Glad we had Michael as our guide! This was our favorite thing we did in Iceland, and we loved everything we did. Our guide, Tim, was friendly and knowledgeable, and the experience itself was just surreal. Highly recommend this on your trip to Iceland! This was our favourite tour that we did (we also did a cave tour and a glacier boat tour) however I was unimpressed with the service we received before the tour began. We had the 3pm tour and since we had a campervan we booked that we would meet them in the parking lot rather than getting picked up a hotel. We arrived earlier (2:20pm) and chilled in the parking lot. At 2:40pm we went to sit by the picnic tables near the Troll trailer. At 3pm a tour bus came and we asked this guide if we were supposed to be with him (and showed him our voucher). He told us no someone would come for us. At 3:30 another guide ran back from the group he was with, outfitted us and told us that we were supposed to be with the guide that had left earlier. He told us to walk (with another couple that was also waiting) to meet the other guide, 15 minutes away. We felt this was very disorganized and unprofessional. The guide was great during the tour was great, and this was definitely something that I would recommend you do if you visit Iceland. The experience is fantastic and unforgettable.. Our guide is Ciga (similar to the pronunciation), and she is very friendly, patient, knowlegable and encouraging., which makes the tour memorable and interesting. Hiking onto the plateau of glacier takes about a little effort, but the awesome view on top of it really reward those efforts. Great and wonderful experience. Really recommend!! We really had fun on trip. Our guide, Sarah, was experienced, informative and friendly. She explained how to use our equipment, checked in with us on how were were doing on frequent stops and asked if we wanted to do more as we were nearing the end of our trip. She was especially good when our adult daughter fell and injured herself. She rushed to her aide, moved her to a safer place and cleaned and bandaged her wounds. Also, our trip had been scheduled for the previous day, which was very wet and windy. As two of us are in our mid- 60’s, we called and asked about the possibility of rescheduling because of our worry about health and safety. Troll obliged. We highly recommend this company to all aspiring hikers! The experience was great and our guide, Sarah, was wonderful. They did have to switch our start time last minute so we had to rearrange our whole day and couldn't get to some things we wanted to see that day. Very friendly team. Very highly recommend Troll Expeditions. They take safety seriously and make sure everyone is comfortable along the way. Our guide made the trek fun and the sight is something else. Book it now, really! I booked this hike for my girlfriend and I and she was very nervous about it. Our guide Sarah was amazing and made sure to pay extra attention to my girlfriend to ensure she was comfortable at all times. After a little while she got used to the cramp-ons and we both agreed it was the best thing we did in Iceland! Highly recommend this hike and if you're on the fence about doing it, book it! You won't regret it. Thanks Sarah for a great experience! An amazing experience! We accidentally arrived a few minutes late for the morning tour, but Harold from the customer service kindly shifted our tour to the afternoon after we told him what happened. And we had an wonderful time on the glacier with our guide Agnes. Thank you Troll team! Had a great time on this tour. Being on the glacier is very different from seeing it from afar. Our guide, Lydia, did a great job. Lots of explanations and keeping everything safe for her guests. One of the best memories from my iceland trip. Worth every ISK. Unforgettable experience! Our tour guide Lydia was very personable and made us feel very safe during the hike. Highly recommend! The most fun experience ever and the scenery was amazing. Our guide Lydia really made the experience extra perfect. Loved the experience! The guide (Lydia) was great! Had a lot of fun! I had a great time on the glacier with my guide Lydia who was very informative as well as professional and made me feel secure on the glacier. All in all it was a really nice hike on a great day. Amazing experience! And with such a guide as Lydia, you get the best of it: interesting data, funny chats and the very best of the glacier itself! I had an amazing experience with Glacier Hiking. Our guide was Lydia. She made our tour very enjoyable and fun. Definitely I would recommend this tour. And if Lydia is your guide you will be so lucky. It was my first time hiking a glacier and I just loved it. What an incredible hike with amazing guides! Breathtaking views and a one-of-a-kind learning experience with Birgir and Jess. This hike was the highlight of our trip with a wonderful group of hikers and our terrific guides. A must for any visitor! What can i say. Amazing experience. Thank you so much Lydia for a wonderful tour on the glacier. Was an incredible experience!!! Everyone was charmed from the beauty that our eyes was seeing and our guide, Eyrun, was the best I could imagine. Thank for making this adventure unforgettable! And for sure, If I’ll come back to Island, I’ll do it again! My girlfriend and I had an amazing time hiking the glaciers with our cheerful and knowledgeable tour guide, Jess. Her attention to detail in regards to safety was very reassuring and her Iceland-related banter was particularly charming. Way to go Jess - I recommend this tour (and tour guide) to everyone! Unreal experience! I went on this tour with my boyfriend. Our tour guide Jess was very personable and made us feel very comfortable and safe during the hike. She was also very knowledgeable about the glacier and Iceland. This was a beautiful scenic walk with lots of great insights about the country. 10/10 would do this again. Thank you Jess! The hike was amazing. Beautiful scenery. Our tour guide Jess was awesome. The hike was very nice escpially thanks to the guide. Our guide Zed was very knowledgeable, easy to follow and very helpful. Our team consisted of three women, which was a perfect team for our trip, and our guide Rosa was so cheerful and informative. The time given to us at all tour spots was just adequate as well. My experience of hiking on mammoth glacier was so special and unique and I could definitely take a lot of instagrammable photos! I thank Rosa so much and I do want to visit Iceland again. This glacier hike was wonderful! The guide was very knowledgeable and paused in great places to teach us some things and take photos. The hike was also a long one! Definitely felt like we truly got to explore the whole glacier. Skill level of "moderate" is accurate - the elevation and length of the hike was not necessarily easy for everyone but we all made it and loved it. Highly recommend. Had a great experience on this hike! Our guide, Lisa, was very knowledgeable and patient. Highly recommend this hike if you are staying in Vik or want to climb a glacier! I booked this tour for my friend and I and we couldn't recommend it more. When we arrived, we had the option to upgrade from a hike to a climb, and it was the best decision! Our guide, Helgi, was awesome. He taught us about glaciers, their relationship with volcanoes, a little bit about the icelandic culture/language, and all about ice climbing! It was the coolest experience and we will remember it forever. It was challenging, but we had so much fun! We both highly recommend this tour! The experience is fantastic. I like the glacier tour very much. Our guide is Ciga (similar to the pronunciation), and she is very friendly and encouraging and patient, which makes the tour memorable and interesting. The glacier is nice, with a crystal blue color, and the tour itself is amazing, walking amid the glacier. Nice experience. Would recommodate it to others. The glacier hike with Troll is one of the amazing experiences I have ever done in my life. The guide was really nice and professional, and I couldn’t explain in words how beautiful the view is. I would definitely recommend glacier hike with Troll Expeditions. We took a hike up an outlet glacier using the expertise offered by Troll Expeditions. Our guide, Gummy (not his Icelandic name but that might not fit in the review) was knowledgeable, friendly and a great guide up the glacier. They provided us with an ice axe and crampons which made the walk quite easy, allowing us to take in the beautiful and unforgettable scenery. We even stopped at our highest point for a drink of pristine glacial water. I would definitely recommend this trip. This was one of the highlights of our Iceland trip. Troll Adventures provided us with an extremely knowledgeable guide, nicknamed Gummy, who gave us a wealth of information regarding the glacier itself as well as the surrounding areas. Our time on the glacier was made even more special due to the fact that we were the first ones up the glacier and were the only ones on it the entire hike. If visiting the southern region of Iceland, this tour is a must do!! This was definitely one of our favorite parts of our Iceland adventure. Troll Expeditions did a great job of having all of the gear ready, which was in very good condition, for us when we arrived with smiles on their faces. The hike itself was the perfect length, not too long and not too short (but then again we had already done one hike before that morning, so our legs were a little tired by this point). Our guide spent the time to make sure that everyone had their gear on correctly, which we really appreciated. He kept the group at a good pace which allowed us to get a lot of hiking in as well as stops for pictures. It was really interesting to hear about the history of the glacier and how it will be gone in our lifetime. As such, I would say this glacier hike is a must do! So glad I booked this trip! It really was something you can't miss while in Iceland. Troll Expeditions gave us a No-Show at the 9:00 am tour, to our great disappointment after we rushed ourselves in pouring rain to make sure we get there on time. Imagine how shocked we were when all the other tour companies were present, except ours. In the end, we adjusted our schedule and joined the trip in the afternoon, and the stunning view of nature literally saved this itinerary. Our guide was patient and passionate in explaining the glacier related phenomenon during the hike, we had a wonderful afternoon experience in awe of nature. 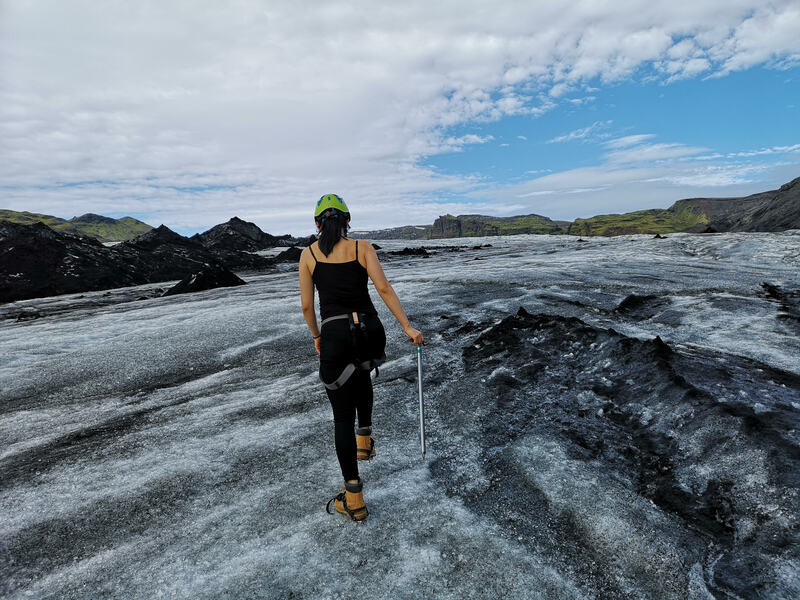 It also made many of us reflect on global warming as we realized and witnessed how much the glacier has receded in the past years... All in all, glacier hike is a must-go in Iceland! Highlight of the trip was going on the glacier hike. It was amazing to hear about the history of the area and our guide, Gummy (like the bear) was very knowledgeable and familiar with the area. More importantly, he was patient with the group when people wanted to take pictures, ask questions, or needed assistance through some of the rougher parts of the hike. Overall, I would highly recommend this company for your trip. My mother, aunt, and I had the best experience with Troll Expeditions. Absolutely breathtaking, hands down my favorite part of our trip to Iceland. We had Sigga as our guide, and she was amazing, informative, and so passionate about sharing the beauty of glaciers and their preservation with us. We had some reservations about how difficult the hike would be, but in late summer (August-September) the weather was perfect, the hike was definitely for any skill level and fun for our whole family. Sigga kept an excellent pace, making sure everyone was safe and keeping up. Can't recommend enough! Just awesome! We had a very nice experience in the glacier! I must empathize the Rose 's job. She was very kind and aware of all of us! Thank´´ s a lot Rose! This tour is a must when visiting Iceland. The views, experience was just incredible. Our local guide, Lydia, was amazing. She was informative, friendly and accommodating to go at my pace. I recently had some health issues and she was very patient with me. Our original time was for 11am but we were moved to a 5pm slot. This was such a bonus for us. We were the one of the last groups to go out and it felt like a private tour. We were almost the only ones on the glacier. Was so incredible!!! Highly recommend this travel group!!! Definitely 10/10 stars¨! I have never been on a glacier before but it was unbelievable! Our guide was very professional and his knowledge was amazing. He told us everything that we wanted to know about the glacier and about Iceland. The glacier hike is one of the best things I have ever done in my life! The glacial hike with Troll Tours was great! For all five of us (2 boys aged 9 and 11, the 2 parents, and grandpa) made it to the top three things we did in Iceland. At first it felt a bit strange to walk with the crampons, but by the end it felt fine. In the more difficult parts there were steps carved into the ice so there weren't very difficult portions on the hike. The glacial water break at the top was appreciated. The views were beautiful and the sound of rushing water unexpected. Our guide was knowledgeable of the glacier and adjusted to our pace. Would definitely recommend! We had an awesome experience with our guide, David. He was on time in picking us up from Reykjavik, and made a few stops on our way to the glacier. We started our tour by hiking into a cave and doing some light meditation, it was pretty awesome! Then we continued on our way to the glacier making stops at two of the most famous waterfalls in all of Iceland. Once on the glacier, David was excellent at communicating important details so that we could have a safe and enjoyable experience on the top of the glacier mountain. On our way back, we were treated to a bike ride to the DC-3 airplane crash site. I would recommend anyone take this tour, it definitely exceeded my expectations and was a steal at the price for the all day adventure we had. Thanks David! L'accueil à été très sympathique et professionnel. Les guides qui se sont succédé étaient tous passionné et ont réussi a nous transmettre leur passion ! Je recommande vivement ces tours ! Mike was a fantastic guide - very knowledgeable, safety-conscious, and funny. Thanks, Mike! Amazing experience! Our guide was fun and informative. Her colleague was helpful and made sure that everyone made it onto and off the glacier safely. The manager of the company came with his bike and gave us a demonstration! It was overall a fun experience! The glacier itself is phenomenal. We were able to see the different layers and learn about the the area! A must do in Iceland!! Amazing hike on the glacier, and our guide was absolutely brilliant. ,,Climb a glacier, they said. It's gonna be fun, they said". I have never climbed a glacier in my entire life but in Iceland you have to do it. It was so much fun, I honestly didn't want to leave the glacier! This trip is going to be the best trip ever! Our guide was so professional and funny. This is the tour you will never forget. I recommend it to everyone, it's 120% worth it! We had some great time on the glacier! It is really amazing to see how much the glacier is declining do to global warming. Our guide was very informative and nice. I felt safe and sound the whole time. This tour is great and I give it my best recommendation! A great experience. From start to finish this tour was incredible. I don't have anything bad to say about this tour or the guide. The guide was so friendly and professional. Everything is thought out for you safety wise so the only thing you have to do is the walking, which was so great because I was really nervous at first. But the guide was so understanding, he made me feel like I was born to do this, a glacier champion! This is a tour worth booking! Awesome tour! David was the best! Absolutely unforgettable experience. It's rare that the person guiding is almost more excited to be there than you are. Mike was bursting with interesting facts about the Glacier and even explained the difference in the composition of the ash on the Glacier (2010 eruption of Eyjafjallajokull and 1918 Eruption of Katla). At every turn he was showing us his favorite spots on the glacier and taking picture of us (and sent them to us following the tour). Finally, nearing the end of the tour we went to something called "The Grand Canyon" and were able to learn how to tell the approximate of age of the Ice. In the end, it was such a fantastic tour, I just may come back to Iceland to do another adventure with Troll Expeditions. Book this tour, you wont regret it...and make sure you ask for Mike "The American Troll". The Ice is incredible blue and the guides are so professional and helpful that you feel like you are a glacier Champion. Being educated about global warming and the effect of glaciers on the landscape on Iceland really made the huge difference. The whole group was captivated by the natural beauty on the GLacier. We fortunately met Healgie (I am not sure if the spelling is correct), Mike and Siga. They are more than friendly and kind. They picked me and my friend from Reykjavik and drove us all the way to Sólheimajökull. Siga told us stories of Iceland along the way. When we went to a waterfall, Healgie taught us how to drink water by doing push-ups haha. Mike kept taking photos for us and that made our memories even better. After the glacier hiking, we were very lucky to have chance to see horses, sheep, and cows at Healgie's home. The glacier hiking was amazing. The tour guides are amazing. The experience is very precious. I love Troll Expeditions and will definitely recommend people choosing this tour :) It is worth every penny you spend! This was an amazing experience from start to finish! When we booked this excursion, I emailed the company because we were unsure if the timing would work out since we intended to do it the day we arrived. I received an email back promptly and with realistic information on the possibility of it not working out if there were flight delays or inclement weather road conditions, but there was a good chance it would be fine so we decided to go for it. When given confirmation that we'd be picked up at our hotel between 9 and 9:30 am I replied asking if it could be on the later end in case our flight was delayed. I received an email back indicating that they were sending a private driver, Gummi, for us at 9:30. This worked out to be incredible for us. Gummi made the whole experience unforgettable. He was polite and patient from the start. He spent hours teaching us about his country: the people, politics, volcano, education, health care, climate, environment, history, etc. He stopped at two waterfalls on the way to the glacier, hiked into them with us, always lending a hand to steady us when needed, and took pictures of us with water cascading all around us. We were also fortunate to have Gummi as our guide on the glacier climb. We felt safe the whole time we were with him and he made the experience exhilarating (even offering to aid us when completing push ups on the ice in order to drink from the fresh flowing water). 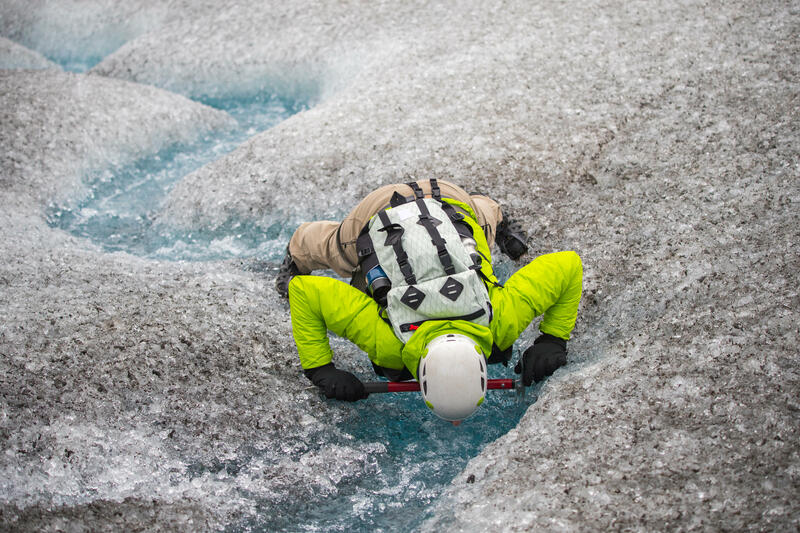 We spent a significant amount of time on the glacier learning about the formation and melting, and Gummi made sure we experienced everything including a climb down into an ice cave. He was always willing to take pictures to document our excitement. On the way back to the city, Gummi stopped at another waterfall and allowed us time to climb (400+ steps) to the top to witness the beautiful view of it cascading down. He continued to educate us on his beautiful country en route back to Reykjavik and we were sorry to see him go when he dropped us off at nearly 7:30 pm that evening. We were thrilled to meet members of Gummi's family along the way and cannot say enough wonderful things about him and this whole excursion. I would do this again in a heartbeat. Thank you, Gummi, for an incredible experience! My favorite tour in Iceland. I went for 5 days and did many things but this was by far the most invigorating unique experience. Initially I was quite nervous about falling but once I got there, met the guide, I felt very safe. Well worth the money. Our tour was run by Troll Expeditions http://trollaferdir.is/ and we booked pick up from them to and from Reykjavik. Two of the guides picked us up early and brought us to two beautiful unique waterfalls (awesome), we stopped to pet the Iceland horses (awesome) prior to getting to the glacier. Our guides were Mike and Bjartur. We ended up hiking the glacier with a different guide (Gisli). All three of them were awesome. Very informative, very friendly and welcoming, and all very experienced in safety and knowledge. On the way home from the glacier they took us to this amazing black sand beach with beautiful basalt columns. I don't have one negative thing to share about this experience and highly recommend it. Bellissima esperienza con guide capaci e disponibili. La giornata non era delle migliori ma la camminata verso il ghiacciaio è stata ugualmente entusiasmante. Ingol, the guide who operates this tour, is probably the coolest guy in Iceland. He has been to Mount Everest twice so exploring the glacier with him was a great experience, as the guy is very passionate about what he does. I made a friend on this trip and can highly recommend it. Hands down best day tour in Iceland. The guide was awesome and being on top of the glacier was an incredible experience. Again, this trip is the best! This tour was amazing, we really wanted to see an ice cave but unfortunately they do not appear in summer. But because we met Ingo he took us to an ice crack that looks exactly like an ice cave and that was super fun. The glacier hike was extremely safe and entertaining. It was not hard at all and highly recommended! If you don't like guided tours, then this is the guided tour for you. The boys were incredible; down to earth, knowledgeable and with some of the best banter I've had while travelling. I was a little hesitant at first but they came very highly recommended from a trustworthy, laid back source and I'm so grateful they were able to squeeze me in last minute. Lots of hidden gems from these local boys and we managed to avoid throngs of tourists the whole time! The small group made it all the more fun and interesting; even though we did a lot of intense stuff- and boy did we pack a lot into one day, I felt at ease the whole time. Never felt like were constrained time-wise, the whole day sailed by at a beautiful pace and the whole thing felt like you were just hanging out with an old friend! Simply put, Amazing! Our tour guide was simply phenomenal, he was very helpful, extremely kind, and overall the best experience you can have on a Glacier or Iceland over all. Kept me entertained the whole time with his overall kindness, humor and knowledge about the area. 5 stars out of 5 easy! I did this tour twice- once in winter and then again in summer, and both times my experience with Troll Expeditions was simply fantastic! 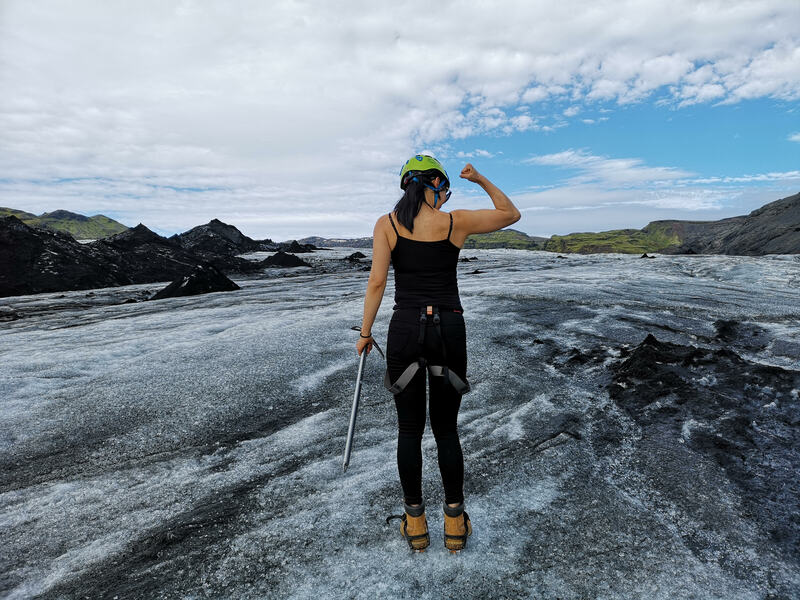 Glacier hiking is a fascinating experience and I would recommend anyone visiting Iceland to book this activity with this company- the guide was knowledgeable, fun, and more importantly inspired confidence among those of us who had never done anything like this before. The tour had a fun, friendly vibe and it wasn't like one of those boring trips where a person seated in the front goes on and on while the rest of the group has dozed off. 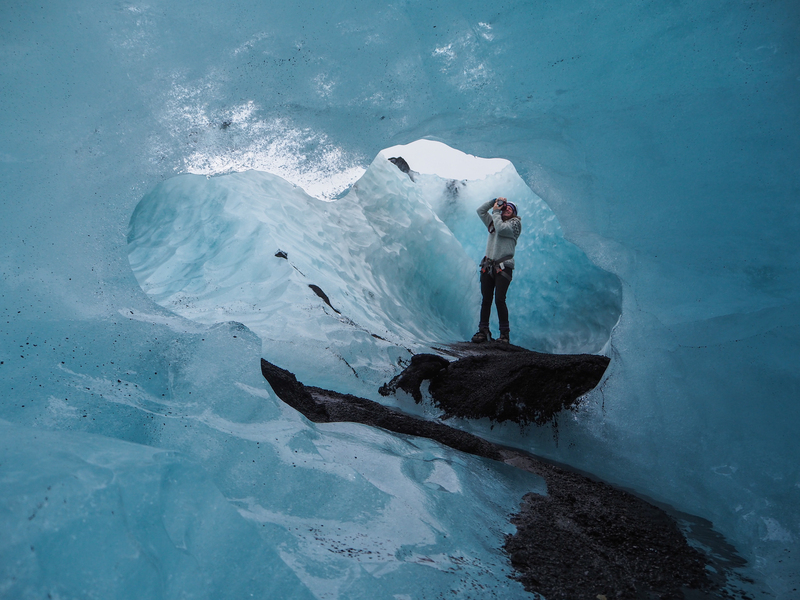 And of course, the experience of glacier hiking itself is like nothing else on the planet. You're filled with awe at the surreal landscape and the kind of adventure that stays with you forever! 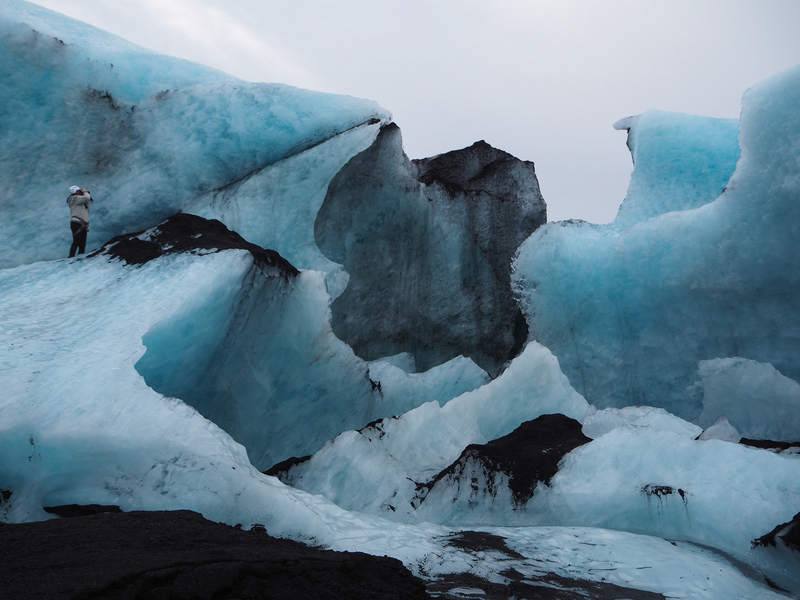 I Went on a Glacier Expedition and tour around the South Cost of Iceland with Troll Expeditions. Our guide was extremely good at his job, full of knowledge about Iceland and the glacier. We stopped at various places, each and everyone with brilliant Icelandic nature but the highlight of the trip was definitely the Glacier Expedition. Being pregnant while I took the hike could have made me really scared but our guide actually made me feel really safe with his professional attitude and leadership towards me and the group. The atmosphere at the glacier was magnificent, everywhere you look is beautiful scenery and you want the moment to last forever. I really recommend this trip to anyone that likes to have fun, enjoy life and do some adventures, it will definitely fill your heart up with great and happy memories. Could have been a fantastic tour. We signed up for a glacier hike. We were really looking forward to it. However, our guide, Mike, was more focused on telling us about his wife and their preferred activity, which was rope climbing/repelling. After about 20 minutes on the glacier, he decided to turn back and to have us repel. We spent an hour standing in one spot in the rain and wind while Mike taught us all about setting up and knotting the rope. Then we waited for each person in the group to go down the rope. If you decide to go on this tour, make sure you get what you paid for.